Physical pain arising from internal pain and anger | Jon Katz, P.C. 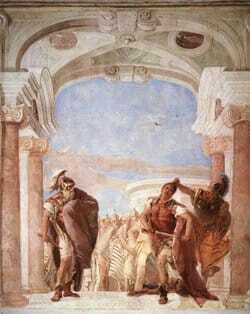 Rage all around us: "The Rage of Achilles" by Giovanni Battista Tiepolo. Numerous times I have talked about the importance of relating well with our clients. In that regard, recently, I learned about John E. Sarno, M.D., who is a Professor of Clinical Rehabilitation Medicine at New York University. Dr. Sarno believes that most back pain is rooted in psychology rather than in physiology, and calls this situation tension myositis syndrome (TMS). He also believes that TMS may also be the cause of various other pain disorders. Dr. Sarno says that the brain causes TMS to protect "you from the unconscious rage and other bad feelings you might have." I know someone — whom I trust very much — who has benefited tremendously from Dr. Sarno’s teachings. Dr. Sarno says that: "One reason why I’ve concluded that we all have rage inside of us is because there are other ‘equivalent’ physical states that seem to be serving the same psychological purpose — conditions that are analogous to back pain. I’m referring to [gastroesophageal] reflux, which is very common; irritable bowel syndrome; headaches; common allergies; hay fever; and asthma. I’m referring to common skin disorders like eczema and others. The skin is a great area that the brain uses to create symptoms. These conditions all serve the same purpose: to keep one’s attention focused on one’s body." While I have long known about the interrelationship between physical health and mental health, Dr. Sarno more closely relates physical pain to internal rage and anger than I ever had thought possible. If Dr. Sarno’s views are accurate and are not exaggerations, this raises a question about (1) the extent to which clients’ physical ailments will tell trial lawyers additional information to help us relate to our clients — and for judges and juries to relate to our clients — beyond exploring only their psychological backgrounds, experiences, and psychological feelings, and (2) whether a medical expert will sometimes be beneficial to help achieve such an understanding. If some clients’ physical ailments may be masking their addressing some of their rage and anger, then they may not even know enough about their rage and anger to relate it to their lawyers. The jury is out about how Dr. Sarno’s findings might assist me in better relating to my clients, I plan to report back after reading his books.